This year KDE has accepted 60 Google Summer of Code students. We are happy with this number, it is more than last year, and I’m sure these 60 students will make a great contribution to KDE as a whole. But this number is still a hard limit: we had to say no to many brilliant proposals. The selection process has not been easy, and we had to make a lot of tough choices. KDE definitely has the mentoring capacity for more than 60 students at a time. So while we cannot come up with more Google Summer of Code slots, we can still make our mentors available through a similar scheme: Season of KDE. Season of KDE is a community outreach program, much like Google Summer of Code, hosted by the KDE community. It is meant for people who could not get into Google Summer of Code for various reasons, or people who simply prefer a differently structured, somewhat less constrained program. Season of KDE is managed by the same team of admins and mentors that take care of Google Summer of Code and Google Code-in matters for KDE, with the same level of quality and care. A great summer working on a really cool KDE project and gaining valuable experience. If you complete your project successfully you also get a T-shirt, a certificate, and maybe a few other goodies. 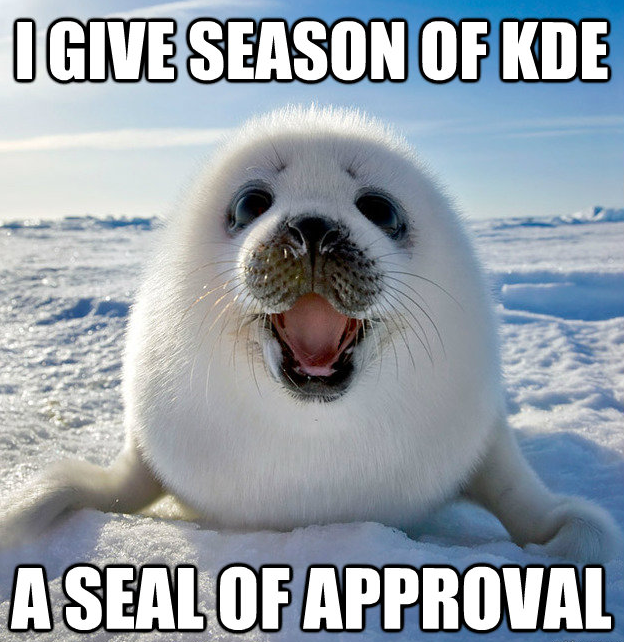 If you are serious about it and have already contacted the relevant KDE subproject to discuss your proposal, fill out the Season of KDE application form and we will get back to you. The timeline is up to you and your mentor. We advise you to stay as close to the Google Summer of Code timeline as possible. The only hard constraint is the application deadline: you apply through the application form before May 7, 2012 at 19:00 UTC in order to be eligible for participation. Do I need to have a mentor before applying? It is preferred. Ideally, you should contact a KDE subproject well before applying, ask for feedback on your idea if you have one, and request a mentor directly. A list of KDE subproject contacts is available on the Google Summer of Code 2012 ideas page. You can also apply without a mentor and we will try to find one for you. Do I need to have a project idea before applying? It is preferred. If you do not have one we will try to find one for you. Keep in mind that the KDE community is pretty big, so you should at least have an idea of which KDE subproject you wish to work on. Do I need to write a proposal like in Google Summer of Code? No, but we would like to see a brief project plan describing what you will be working on. Is it only for coders like Google Summer of Code? We are willing to consider non-coding projects as well, but you should definitely get in touch to figure out the details beforehand. The KDE Community Wiki describes ways to get involved with KDE that do not require coding. I applied for a project in Google Summer of Code but another student got selected for it. Can I still work on it? Maybe, but likely not. You should ask the mentor that was assigned to your idea. We can try to find something related for you if you want, or something completely different. Let us know what you wish and we will do our best to accommodate your request. Is this an extension of Google Summer of Code or connected to Google? No. While Season of KDE is in many ways modeled after Google Summer of Code and administered by the same members of the KDE community, it is completely independent from Google Summer of Code and has no connection to Google whatsoever. For further questions feel free to join our IRC channel #kde-soc on Freenode or email the admin team at kde-soc-mentor-owner@kde.org. Are you going to be one of them? You should be!